Osteopoikilosis is an inherited condition with autosomal dominant trait resulting in sclerotic foci throughout the skeleton. It has been suggested that loss-of-function mutations of LEMD3 gene located on 12q14.3 result in osetopoikilosis. A bp heterozygote deletion was detected in our patient at the cytosine nucleotide at position 1105 with molecular genetic analysis. Although this mutation has not been previously described, it was considered to be the most likely cause of the disease in our patient due to frame shift and premature stop codon formation. As in our case, three phase bone scintigraphy and whole body imaging did not reflect the true extent of lesion sites and lesion activity. SPECT/CT images could reflect lesion location and activity more accurately, and could be a good alternative for differential diagnosis of unexplained bone pain and sclerotic lesions in one examination. Surgical and Medical Practices: G.S., M.E., T.A., Concept: G.S., Z.E., Design: G.S., A.Ö., Data Collection or Processing: G.S., M.E., T.A., Analysis or Interpretation: G.S., H.G., S.K., Literature Search: G.S., Writing: G.S. 1. Benli IT, Akalin S, Boysan E, Mumcu EF, Kiş M, Türkoğlu D. Epidemiological, clinical and radiological aspects of osteopoikilosis. J Bone Joint Surg Br 1992;74:504-506. 2. Van Hul, Vanhoenacker F, Balemans W, Janssens K, De Schepper AM. 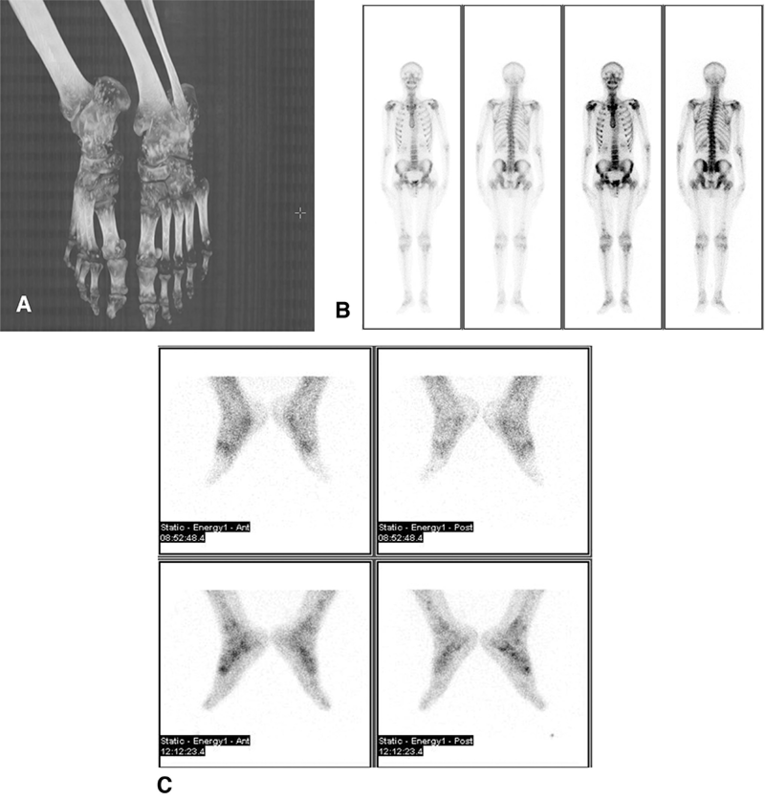 Molecular and radiological diagnosis of sclerosing bone dysplasias. Eur J Radiol 2001;40:198-207. 3. Ben-Asher E, Zelzer E, Lancet D. LEMD3: the gene responsible for bone density disorders (osteopoikilosis). Isr Med Assoc J 2005;7:273-274. 4. Korman B, Wei J, Laumann A, Ferguson P, Varga J. Mutation in LEMD3 (Man1) Associated with Osteopoikilosis and Late-Onset Generalized Morphea: A New Buschke-Ollendorf Syndrome Variant. Case Rep Dermatol Med 2016;2016:2483041. 5. Ito Y, Miyazono K. RUNX transcription factors as key targets of TGF-β superfamily signaling. Curr Opin Genet Dev 2003;13:43-47. 6. Pan D, Estevez-Salmeron LD, Stroschein SL, Zhu X, He J, Zhou S, Luo K. The integral inner nuclear membrane protein MAN1 physically interacts with the R-Smad proteins to repress signaling by the transforming growth factor-β superfamily of cytokines. J Biol Chem 2005;280:15992-6001. 7. Lagier R, Mbakop A, Bigler A. Osteopoikilosis: a radiological and pathological study. Skeletal Radiol 1984;11:161-168. 8. de Vernejoul MC, Kornak U. Heritable sclerosing bone disorders: presentation and new molecular mechanisms. Ann N Y Acad Sci 2010;1192:269-277. 9. Tsai SY, Wang SY, Shiau YC, Wu YW. Benign incidental findings of osteopoikilosis on Tc-99m MDP bone SPECT/CT: A case report and literature review. Medicine (Baltimore) 2016;95:e3868. 10. An YS, Yoon JK, Lee MH, Joh CW, Yoon SN. Abnormal bone scan in an adult with osteopoikilosis. Clin Nucl Med 2004;29:856-858.